The first iteration of the venerable -60 line, the F/A-60A Rogue is a fifth-generation single-seat, twin-engine, all-weather semi-stealth tactical multirole fighter designed and built by Halcyon Arms and Asimov Engineering. Primarily meant to be an air superiority fighter, the Rogue is also a capable ground strike fighter and reconnaissance/signals intelligence and electronic warfare aircraft. The goal of the F/A-60A is not to be a stealth fighter, but it does maintain some stealth characteristics to help in evasion. In initial design, the aim for the F/A-60A was to develop a hyper-maneuverable fighter with some stealth characteristics that would cost less than the modern stealth aircraft, and still be able to take out such stealth aircraft, and, were it to meet them in a dogfight, be able to outclass them in speed and maneuverability. In order to attain this maneuverability, the entire -60 line is equipped with 3D Vectored Thrust Nacelles. The -60 line features a low-to-moderate aspect ratio, swept, semi-cranked arrow main wing, with similar tail horizontal stabilizers and back-swept tapered canards in a three-surface configuration. It also features a slight chine above and forward of the air intakes, of which there are one on each side. There are also canted vertical stabilizers to help reduce radar signature and improve maneuverability; these stabilizers, as well as the horizontal stabilizers, also assist in running air through the exhaust to break up the heat signature. The Rogue sports traditional fighter tricycle landing gear. As a standard, all -60 line aircraft also feature a tail-hook and reinforced airframe to allow for carrier flight operations. To assist with carrierborne operations, the entire -60 line can also operate "hands-free," allowing it's avionics, to include fly-by-wire, to operate both launches and landings. These systems also help with normal flight, converting pilot control into actual plane operation, making minor adjustments where needed to allow the pilot to focus on what he or she wants the aircraft to do. This allows the aircraft to be highly departure resistant and to respond well even with an aggressive pilot; the aircraft often is required to impose a limit upon it's own operations to prevent putting too many -g forces on a pilot, which could cause a blackout. An integrated cockpit and flight suit is also able to detect the black-out, and should course correction or evasion be needed, the -60 line is programmed with basic functions and maneuvers for survival. The Rogue is capable of sustained supercruise without use of afterburners, allowing for efficient high-speed flight faster than Mach 1, which also allows it to fill the role of Interceptor. Last edited by Pharthan on Mon May 09, 2016 7:13 am, edited 14 times in total. There is little difference between the F/A-60A and the -B models, other than that the B model sports an additional Weapon Systems Operator. This means that the -B models are not quite as maneuverable due to the additional size, but are better with strike missions, standoff-range air-to-air, and reconnaissance while the -A models are better with dogfighting and are more maneuverable. Last edited by Pharthan on Tue May 10, 2016 5:54 am, edited 9 times in total. The smallest of the F/A-60 line and with the smallest internal payload, the F/A-60C Viper is meant more as an Air Superiority Fighter than a multirole fighter. With a light payload and a single engine, the F/A-60C fighter is by far one of the most maneuverable fighters ever designed by Halcyon Arms, able to pull maneuvers so tight that fighter must be limited by computer to each individual pilot's capabilities. Last edited by Pharthan on Mon May 09, 2016 7:13 am, edited 10 times in total. The Thresher is the Electronic Warfare aircraft of the line, equipped with high tech electronic warfare systems to include multispectral scanning and jamming systems, and is also able to create "ghost" targets to imitate other aircraft or generate radar signatures of other aircraft to feign an assault from where it is not occurring. The primary role of the Thresher is to eliminate air-defense sites with anti-radiation munitions. 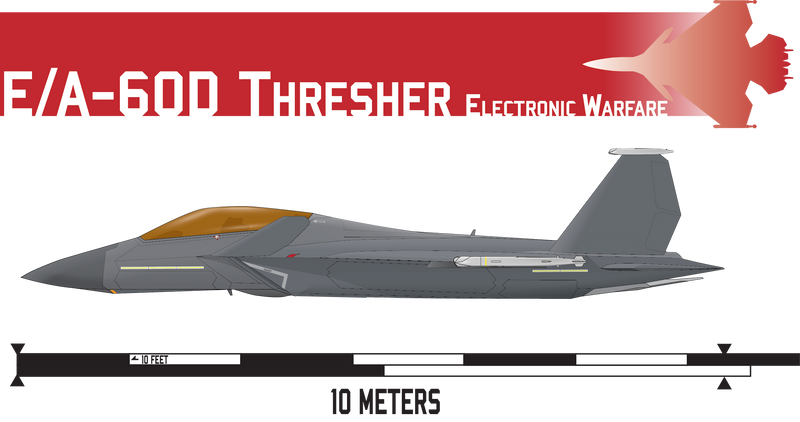 Due to it's heavy load out of electronics gear, the Thresher is also capable of acting as a reconnaissance aircraft, primarily in intercepting transmissions. Last edited by Pharthan on Tue May 10, 2016 6:10 am, edited 13 times in total. To assist in standardization of equipment, Halcyon Arms developed the F/B-60E, a fighterbomber model. It sports a widened fuselage to improve internal payload and range, as well as additional wing-pylons. to allow it to deliver improved amounts of ordnance, though it is considerably stealthier without the wing-pylons; indeed, using only internal ordnance, the Rebel is the stealthiest model of the -60-line. While intended more for bombing, the internal payload improvements also lend the Rebel to be able to perform well in standoff-range air-to-ar roles. Last edited by Pharthan on Tue May 10, 2016 6:21 am, edited 13 times in total. With the rise of Halcyon Arm's desire to help fund smaller Navies, smaller ships came about. Seeing that not all Navies could afford massive carriers, Halcyon Arms still desired to give the right to a full fledged multirole fighter to those less financially backed, as well as to give Pharthan's own patrol helicopter carriers some more punch. The acclaimed F/A-60A was chosen as the baseline model for it's two engines - leading to more stability when landing, if albeit more weight than conventional VTOL fighters - and the Outlaw as born. In order to make it a VTOL, the F/A-60 was modified with a shorter, more cut back lower set of nacelles, allowing the upper nacelles to direct thrust directly downward. The thrust-vectoring nacelles are able to move up, down, and side-to-side at an angle of 15 degrees either way, giving the Outlaw stability when landing only matched by helicopters, also improving survivability and assisting with single-engine landings, which are possible but not recommended. While the two powerful engines are able to provide the necessary stability, an advantage over single-engine VTOLs, the Outlaw is also fitted with a pair of stabilizing cold-exhaust vents stemming from the lift-fan located just behind the cockpit, which primarily forces air down and forward to keep the Outlaw stable when landing. The Outlaw sacrifices combat radius and speed to maintain the weapon loadout of the Rogue as well as full avionics and electronic warfare capabilities. Last edited by Pharthan on Mon May 09, 2016 7:12 am, edited 10 times in total. The first unmanned iteration of the venerable -60 line, the Q/F-60G Ronin is a fifth-generation unmanned combat aerial vehicle, twin-engine, all-weather semi-stealth tactical multirole fighter designed and built by Halcyon Arms and Asimov Engineering. Primarily meant to be an air superiority fighter, the Ronin is also a capable ground strike fighter and reconnaissance/signals intelligence and electronic warfare aircraft. The goal of the Q/F-60G is not to be a stealth fighter, but it does maintain some stealth characteristics to help in evasion. In initial design, the aim for -60 line of fighters was to develop a hyper-maneuverable fighter with some stealth characteristics that would cost less than the modern stealth aircraft, and still be able to take out such stealth aircraft, and, were it to meet them in a dogfight, be able to outclass them in speed and maneuverability. In order to attain this maneuverability, the entire -60 line is equipped with 3D Vectored Thrust Nacelles. The Ronin is capable of sustained supercruise without use of afterburners, allowing for efficient high-speed flight faster than Mach 1, which also allows it to fill the role of Interceptor. Initially, the QF-60G began as a testbed aircraft for the F/A-60A airframe and systems, to test the absolute limits of the fighter design. It was not until later that it was realized that their own testbed aircraft could make a venerable fighter. While lacking a pilot in the cockpit to make the fighter more aware of battlefield scenarios, the Ronin compensates with something none of it's manned counterparts can - it can use the full extent of maneuverability. Without a pilot susceptible to blacking out, the remotely controlled Ronin can perform maneuvers deemed ridiculous and impossible for a manned aircraft to do, giving this UCAV unparalled agility. Last edited by Pharthan on Mon May 09, 2016 7:12 am, edited 8 times in total. The Badwolf is capable of sustained supercruise without use of afterburners, allowing for efficient high-speed flight faster than Mach 1, which also allows it to fill the role of Interceptor. Last edited by Pharthan on Tue Feb 23, 2016 5:40 pm, edited 5 times in total. 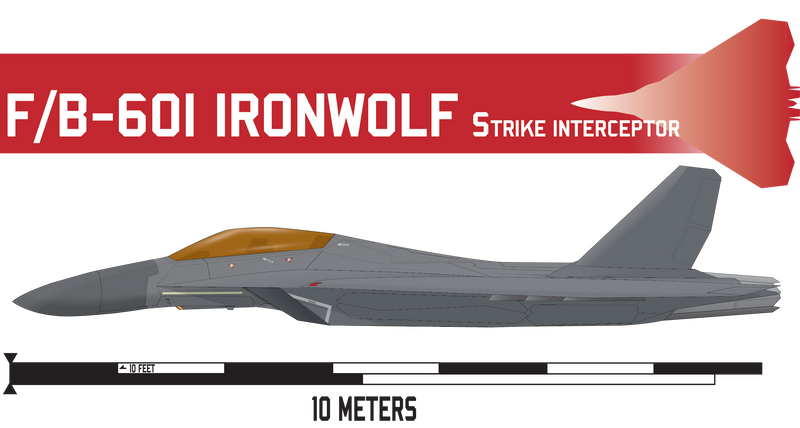 The Ironwolf is capable of sustained supercruise without use of afterburners, allowing for efficient high-speed flight faster than Mach 1, which also allows it to fill the role of Interceptor; it's large weapon's payload and high speed also allow it to fill the roll of being a tactical bomber. Last edited by Pharthan on Mon Feb 01, 2016 4:47 pm, edited 1 time in total.